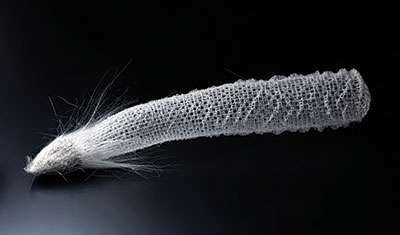 Nature provides myriad examples of unique materials and structures developed for specialized applications or adaptations. An interdisciplinary group of researchers at the U.S. Department of Energy's Ames Laboratory is trying to unlock the secrets that organisms use to build such complex structures so that power can be used to create materials not found in nature and not capable of being synthesized by conventional means. "Nature has lots of examples of these hierarchical structures and they're usually organic-inorganic composite materials," said Surya Mallapragada, Ames Laboratory scientist and Iowa State University Carol Vohs Johnson Chair in Chemical and Biological Engineering. "A glass sea sponge skeleton is a perfect example of these structures that are templated by the organic phase. You have inorganic nanocrystals that form and it's a multiscale assembly process, which in most cases happens at mild temperatures and conditions, such as pH." "So we look to nature for inspiration and as a source of bio-molecules to see how we can recreate some of those processes that create these wonderful materials with hierarchical assemblies or uniform structure," she said of the research which is funded by the DOE-BES Biomolecular Materials Program. So far, Mallapragada's team has been able to replicate the creation of magnetite by studying magnetotactic bacteria. These bacteria form magnetic nanocrystals or chains of nanocrystals that they use to orient themselves with the Earth's magnetic field. Using self-assembling polymer templates and proteins from the bacteria, researchers were able to grow magnetite crystals. "We've used this approach successfully to grow magnetite nanocrystals," Mallapragada said, "but we've gone beyond that, using these techniques to create cobalt ferrite and other magnetic nanocrystals that are not found in nature. That's a great example of templated synthesis." "In some case, we need to come up with synthetic analogs which can do the same job, but are more robust," Mallapragada said. "In many cases, the biomolecules aren't as robust. Proteins are fragile molecules so if we can do it with synthetic polymers, that gives us a lot more flexibility." It's one thing to create nanocrystals. Getting those nanocrystals to then organize and form microstructures and then macro-scale structures is something altogether different. "They're not at the level of complexity we see in nature —that's the Holy Grail," Mallapragada explained, "but that's the inspiration and we're trying to get there with synthetic approaches." The latest goal for harnessing this natural building process is the creation of metamaterials, so-called left-handed materials that have interesting optical properties that don't occur in nature. "We're looking at using organic templates to assemble inorganic particles to get the desired properties," Mallapragada. "We have a very strong collaboration with Ames Laboratory physicists Costas Soukoulis and Thomas Koschny, and they've done some wonderful work with simulations and predictions of structures and developed some lithographic structures, but those are only 2-D. So it's really a perfect case for using these bioinspired approaches to self-assemble these metamaterials into 3-D structures." Mallapragada again points to the glass sea sponge for the type of multiscale assembly that's required to build 3-D metamaterials. "The sea sponge has order on multiple scales—nanoscale, micron-scale, millimeter-scale. It's a multi-scale assembly— it looks like the Eiffel tower—and that's why it has a very great strength to weight ratio," she said. "So we need a similar hierarchy. Define the shapes at nanoscale, but then have an ordered arrangement of these nanoscale objects in 2-D and then 3-D to get the desired properties." "It takes a very interdisciplinary approach," Mallapragada said. "We have molecular biologists (Marit Nilsen-Hamilton) for the DNA side, materials chemists (Mallapragada) for the polymer synthesis, Soukoulis and Koschny for the theoretical prediction of the structures and (physicist) Alex Travesset for modeling the kinds of structures can we get." "We need good characterization so David Vaknin is looking at scattering methods and Tanya Prozorov has been doing transmission electron microscopy work," she continued. "Andy Hillier (chemical/biological engineer) has been involved in metallization, applying the continuous film of gold on those nano structured templates. So it's a multi- level, multi-step, multi-component synthetic process."